Port Coquitlam School Trustees Christine Pollock and Michael Thomas were inaugurated on Tuesday evening. Christine Pollock was named as vice-chair. School District No 43. (Coquitlam) congratulates our newly elected and re-elected* Board of Education Trustees. They will be officially sworn in at the inaugural meeting of the SD43 Board of Education on Tuesday November 6, 2018. The School District No. 43 (Coquitlam) Board of Education is comprised of nine elected trustees charged with the governance of the school district including establishing goals and policies and approving the annual budget. 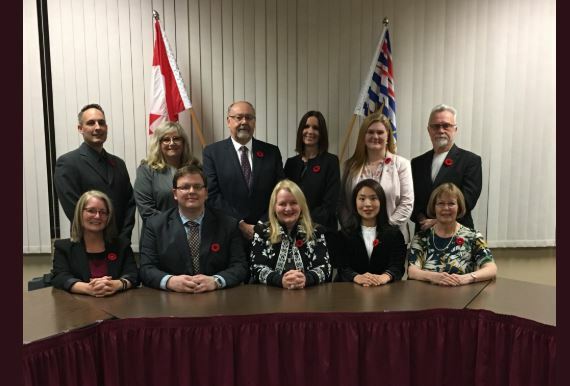 They are accountable to the Provincial Government and represent the school district in the communities of Coquitlam, Port Coquitlam, Port Moody, Anmore and Belcarra. Their roles and responsibilities are complex and based on several Acts, government and district policies, legislation, and statutory requirements. Trustees are elected for a four-year term during civic elections. The 2018-2022 #SD43 Board of Education will hold its Inaugural Board Meeting tonight (November 6th), 7pm at Winslow Centre in the Gallery Room. Public welcome to attend.